A crystal found in a shipwreck could be similar to a sunstone – a mythical navigational aid said to have been used by Viking mariners, scientists believe. The team from France say the transparent crystal may have been used to locate the Sun even on cloudy days. This could help to explain how the Vikings were able to navigate across large tracts of the sea – well before the invention of the magnetic compass. However, a number of academics treat the sunstone theory with scepticism. The team from the University of Rennes in France say they found the crystal while examining the wreck of a British ship sunk off the island of Alderney – in the English Channel – in 1592. An oblong crystal the size of a cigarette packet was next to a pair of dividers – suggesting it was part of the navigational equipment. It has now been shown that it is of Iceland spar – a form of calcite known for its property of diffracting light into two separate rays. Testing a similar crystal, the scientists proved that by rotation it was possible to find the point where the two beams converge – indicating the direction of the Sun. They say it works on cloudy days, and when the Sun has set. This particular piece of Iceland spar was found on the British vessel long after the Viking heyday in the ninth and 10th Centuries. But the scientists conjecture that use of sunstones may have persisted for many centuries as a back-up to the often unreliable magnetic compass, which was introduced in Europe in the 13th Century. There is only a sketchy reference in the old Viking legends to the sunstone. 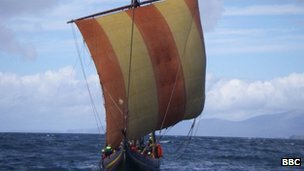 Vikings were seafarers from Scandinavia who used their longboats to explore and conquer parts of Europe, Greenland, Iceland, Russia and North America.